Pain relief for Excel Headaches - IT Solutions for the SMB Market. IT Solutions for the SMB Market. Have you ever wondered if Microsoft Excel was invented by a sadist? Trying to edit multiple files at one time becomes a game of "Find the worksheet." You know that the feature you need is on one of the ribbons, but which one? And a large, funky workbook file can slow the program down so much, you need to take a coffee break after altering a single number. Let's face it: If you do a significant amount of important work in Excel, you're dealing with one nightmare after another. And if you find that using Excel is more difficult than tracking your finances with a pencil and paper, something isn't adding up properly. I'm here to help, with solutions to five common nightmares found in Excel 2007 and 2010. I'll tell you how to manage multiple workbooks effortlessly, speed up a slow file, track changes from multiple users, find the feature you need among all the ribbons, and enter data more easily. In Excel you have two clear and obvious ways to work on three or more spreadsheets: You can have too-small windows that don't give you the big picture, or you can clumsily switch between them. Arrange your windows so that you can see multiple workbook files at the same time. When you launch Excel, it opens a single window on the Windows desktop. When you open or create another workbook (an Excel file that can contain one or more worksheets), that opens an internal window within the Excel window. You can maximize internal windows so that each one fills the entire Excel window, or restore them to view them all at once. Unless your worksheets are exceptionally small, you should keep the inner windows maximized (the default setting) so that they fill the whole Excel window. You can switch between worksheets by pressing Ctrl-Tab or, to go in the other direction, Ctrl-Shift-Tab. That approach works well if you have only two files open--but the more files you add, the more you might cycle through them, going in the wrong direction and then wasting time circling back. Another problem with the technique is that it doesn't allow you to examine two workbooks at the same time (which, depending on what you're doing, may come in handy). Demaximize a spreadsheet's window by clicking the second Restore icon from the top.For that, click a workbook's Restore button, which you can find below Excel's Restore button in the upper-right corner. Then you can resize and rearrange the windows for better viewing. You can also minimize those you don't want up at the moment. If you use two monitors, click Excel's own Restore button so that the application is no longer maximized, and then drag the edge of Excel's window so that it fills both monitors. You'll have much more room for arranging windows. Your final option--and the best in my opinion--is to download and install one of ExtendOffice'sOffice Tab products. These Office add-ins place each open file in its own tab at the top of the application window. You sacrifice a small amount of screen space, but gain the ability to switch easily between multiple windows. The free edition adds tabs to Word and PowerPoint as well as to Excel, and can handle pretty much everything you need it to do. 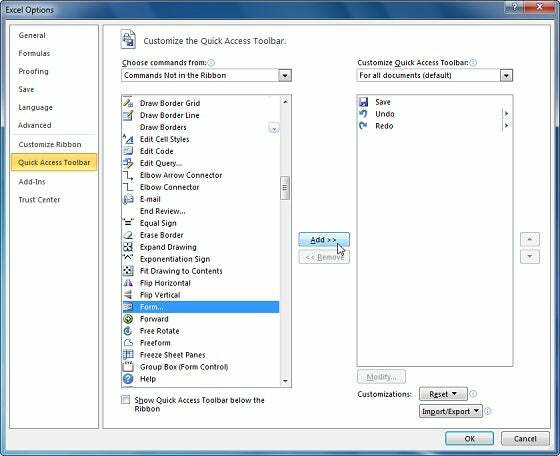 ExtendOffice's Office Tab lets you switch easily between open files. You double-click a worksheet in Windows Explorer and wait for it to load into Excel. And wait. And wait. Finally, it loads. You change a number, and then you wait some more. It's hard to say why a particular Excel workbook file becomes so slow that it's unbearable to use. Here are three common culprits and what you can do about them. Too many calculations: In complex workbooks, changing one number can affect hundreds of reiterative calculations, and Excel takes time to work out each one. The solution is to turn off automatic calculations, which you can do from the Options dialog box. 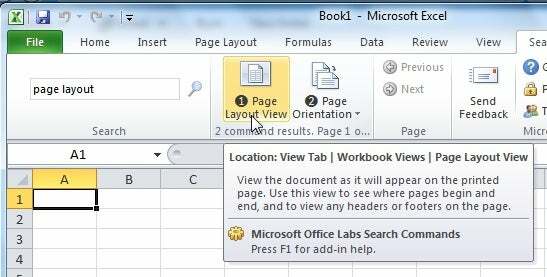 To get there in Excel 2010, click the File tab, and then select Options in the left pane. 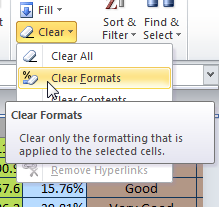 In Excel 2007, click the round Office button, and then click the Excel Options button at the bottom of the drop-down menu. Once you're in the Options dialog box, select Formulas in the left pane. For Workbook Calculations, select Manual. Just remember that the numbers won't be correct until you either save the file or press F9. Too much formatting: A spreadsheet doesn't have to be pretty, so use as little formatting as you need to keep it legible. If a spreadsheet behaves too slowly, try clearing the formatting.To find out if formatting is slowing down the file, make a copy of it and open the copy in Excel. Select the entire worksheet by pressing Ctrl-A. If the workbook has more than one worksheet, hold down Shift while you click the last tab at the bottom of the window so that you select all of the worksheets. Then, in the Home ribbon's Editing section, click the drop-down arrow by the Clear icon (which looks like an eraser) and select Clear Formats. Save the file. If this new file is significantly faster than the old one, you overformatted the original file. The file is bigger than it needs to be: It's no surprise that big files are slower. But some big files can benefit by slimming down. To find out if your file is one of those, press Ctrl-End, which takes you to the last cell in the worksheet. Yes, you can see other cells below and to the right, but Excel doesn't actually save them until you put something in them. If the cell you land in is far below the last row containing any content, or far to the right of the last such column, you have a file with unnecessary overhead. The solution? Copy the actually used cells to a new worksheet in the same workbook, and then delete the old worksheet. Quick: Do you know on which ribbon you can find the Page Layout icon? Hint: It isn't the Page Layout ribbon. The ribbon interface, introduced with Office 2007, is supposed to make Excel and other applications easier to use. Sometimes it does--and sometimes it leaves you clicking ribbons in a time-wasting search. Install Search Commands, and you'll never have to click through the ribbons looking for the feature you want. Search Commands, a free add-on from Microsoft Office Labs, takes care of the problem. Once you install the add-on, it presents a ribbon where you can search for commands. If you and a coworker both edit the same workbook, you have a problem. If three or four of you fiddle with the same file over the network, you have a potential catastrophe. Luckily, everything you need to keep the workflow under control is in one place: the Review ribbon. Here are three essential tools on the ribbon that can help you. See changes at a glance: Want to see who made what changes when? Drop down the Track Changes menu and select Highlight Changes. Then fill in the options. You can control how long the changes will be saved, whose changes need to be tracked, and whether they should be listed on a separate sheet. You can also accept or reject changes. Protect your spreadsheet before you let other people fiddle with it. You'll sleep better. 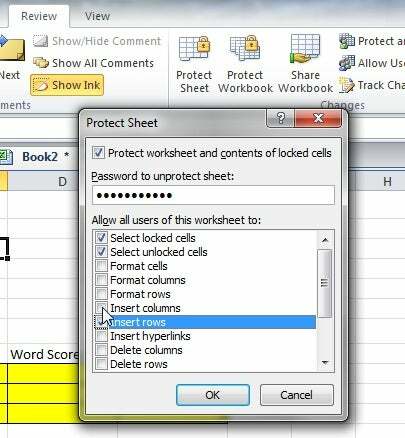 Protect all or part of the file: The Protect Sheet and Protect Workbook options allow you to control who can change what. Click either of those buttons, and you'll be able to password-protect various aspects of the file. Share the workbook: The Share Workbook option permits more than one user to alter the spreadsheet simultaneously. And if you're thinking that such a setup could only make things worse, relax--if a conflict crops up at the time you save the file, a dialog box shows you both options and lets you choose. Spreadsheets aren't database programs, but everyone uses them as such, entering columns and rows of data into tables. Why not? It's a lot easier to set up a simple table in Excel than to create a real database in something like Access. 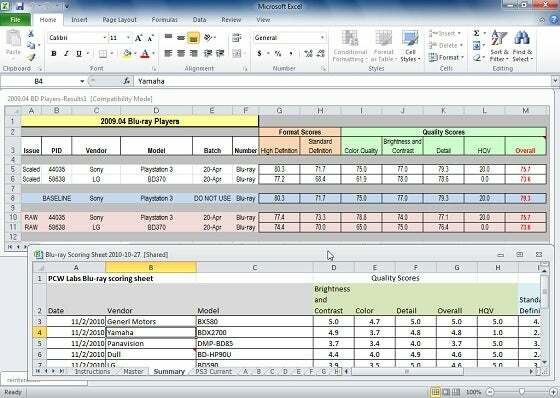 Here's why not: The data-entry process is a lot more difficult in Excel. A real database, after all, gives you a form for entering data, which is a lot friendlier than a spreadsheet's table layout. The final step: Add the Form icon to the Quick Access Toolbar. 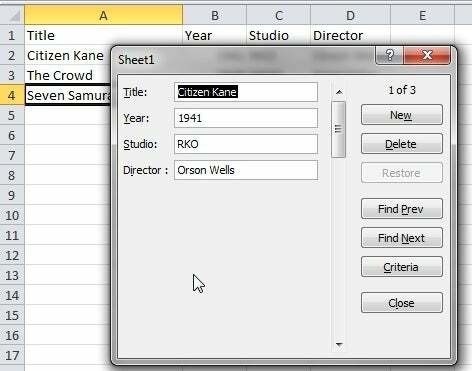 The fix is simple: Bring up a form for data entry in Excel. And doing that is as easy as selecting any cell in the table and clicking the Form icon. Well, it's that easy after you've made the Form icon visible. Click the down arrow at the right end of the Quick Access Toolbar, and then select More Commands. In the 'Choose commands from' drop-down menu, select Commands Not in the Ribbon. Scroll down to and select Form. Click theAdd button. Now you can select any cell in the table, and then click the Form icon. Up comes a data-entry form. A simple form makes data entry much easier. If you want more shortcuts and tips, we have a free Quick Tip 1-sheets on Excel, Word and Outlook to help you navigate through them faster. "When you need IT, think of TVG"
Thanks for your thoughts or comments. IT Consulting, Business networks and computer systems can have issues: email servers down, cannot access files, internet always slow, chronic issues, high monthly bills. These are called IT Headaches. TVG is the "Providing the Ibuprofin for your IT Pains" We specialize in providing Tech Support for Small And Medium Sized Businesses in the Los Angeles area by establishing a 24/7 reliable network and constant security for their data.